The Model 776 Size Machines Sound Reducing Cover is a highly functional sound reducing cover perfect for any quiet environment or office environment. Please call 800-424-4459 for pricing. 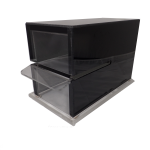 The Model E & T Size Machines Sound Reducing Cover is a highly functional sound reducing cover perfect for any quiet environment or office environment. Please call 800-424-4459 for pricing.